The Round Greek Sailing Ship Wooden Shield is a beautiful hand-made, hand-painted round shield that depicts a Greek ship known as a trireme. The design is based on Ancient Greek artwork that was once used on pottery and shields. Hade-painted using only the finest artist-grade paints, this round shield features a blue Grecian ship known as a trireme, sailing across stylized blue waves. The ship is set against a white background and surrounded by a red-orange wave pattern that acts as the border of the entire shield. This fully-sized shield possesses a 31-inch diameter and is made from 0.5 inch thick smooth composite wood, which gives the shield a measure of strength and durability that typically is not seen in other wood-based materials like plywood. Dual leather straps are attached to the back of the shield for carrying and use. One strap wraps around the forearm while the other is gripped by the hand for a secure, sturdy, and effective hold. The front of the shield has had several coats of varnish applied to add further protection that will help preserve the ship from the wear and tear of time and use. 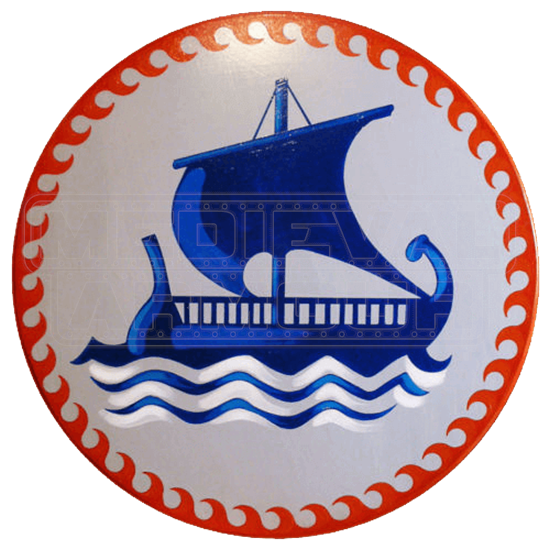 Far from your average shield, the Round Greek Sailing Ship Wooden Shield is an attractive piece that looks just as great hung on a wall as it does in the hands of a well-trained knight or swordsman. It has the beauty of a decorative piece and the function of a shield all wrapped into one quality package.